‘App not installed’ or ‘Application not installed’ or ‘Error parsing file’ are very common error messages most Android users normally encounter while trying to install a new application on their Android smartphone. This might appear as a big problem for the non-techie users with lesser knowledge of how Android works, but for others, it is not a problem until it happens to be the only thing between you and your newly downloaded Android app. The good news is that there are easy ways to fix this Error message that doesn’t require you to be a tech savvy to be able to carry them out, we will be covering these ‘easy fixes’ at the course of this article. One thing common with the ‘App not installed’ error message is that they always occur when you are trying to install an application from an unknown source. Maybe you downloaded the app from net or it was shared to you by a friend, as long as it is not from Google Playstore, the source is unknown to your Android device. 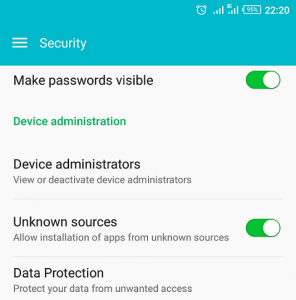 For security measures, Android phones are set to disallow apps from unknown sources by default but you can turn it off from your phone settings. To do this, head over to you device settings then navigate to ‘Security’ and tick or toggle-on the ‘Unknown sources’ box as you can see below. But before you install any application that is not coming from Playstore, make sure it is from a trusted and verified publisher to avoid installing malicious and harmful apps. Bad Apk File: Bad or corrupted apk file is one of the major causes of ‘App not installed’ error message on Android phones, the file might have been corrupted during the downloading process because it wasn’t downloaded completely or the file wasn’t completely copied from another device. Low Android Version: Some apps are specifically made to work on later versions of Android OS, so the version on your device might not be supported by the app, ‘Error parsing file’ is usually the error message you will encounter in this case. Conflicting app signature: This occurs when you want to install a newer version of an already installed app, but the newer version has a different certificate from the old one. 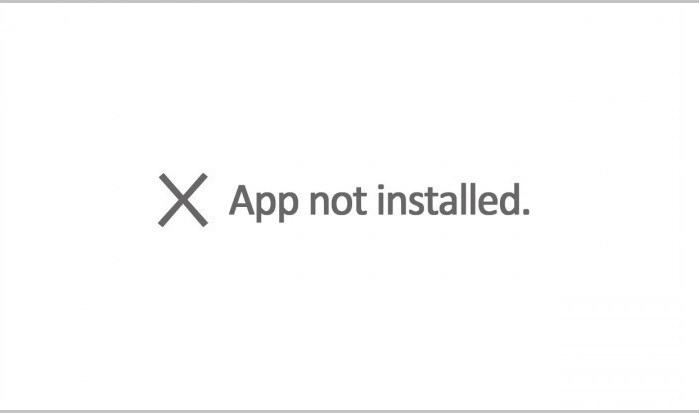 Also, trying to install apps with no signature (unsigned apps) can land you to ‘App not installed’ error message. Not enough storage space: When the app you want to install requires more than what is left of your storage space, you can’t escape the ‘Application not installed’ error message. Wrong installation path: While some apps can be installed on both phone memory and SD card, others require to be installed only on the phone memory. Trying to install them on SD card will only show you the error message. Corrupt installation path: If the storage location you are trying to install your app on is bad or corrupted, app installation may fail. Improperly mounted SD cards: The SD card on the device may have not been mounted properly or it is not accessible because it has already been mounted on another device. Reboot your phone: As simple as it may sound, rebooting your Android device may be the solution to the App not installed problem you are facing. Doing this will free up the phone’s random access memory (RAM) which will help the device to work more efficiently. Free up some storage space: Simply delete files and uninstall apps that are no more in use to give room for your new app. If you are not convenient with this, you can option to buying SD cards with bigger storage capacity. Uninstall the old version: If the app you are trying to install is already installed on your phone, first uninstall the app before trying to install the new one, the app’s signature maybe in conflict. Double check your Apk file: Make sure the Apk file you are trying to install was completely downloaded or fully copied to your device. Change installation path: Check your app’s installation location or path and preferably change it to ‘Choose automatically’ or ‘Let system decide’. Reset App preferences: Resetting apps preferences might do the trick, you can do this by going to your phone settings -> Apps -> All and then click the menu key and select ‘Reset app permissions’ or ‘Reset app preferences’ from the drop down menu. Check Android version: The app you are trying to install may not be compatible with the Android version on your phone, you can check this by looking up the app’s detail/information page on Playstore or on the net. Properly mount your SD card: Check and make sure the SD card is properly mounted and accessible from your device, also make sure it is not mounted or connected else where. Backup and format your SD card: Backup important files on your SD card to somewhere else and format the SD card. Reset your phone to factory settings: This means to entirely wipe your smartphone so be sure to think it through before proceeding with this step. You can do this from recovery mode or through ‘Settings’ -> ‘Backup and reset’ and then click on ‘Factory data reset’. Try to install the app again to see if the ‘app not installed’ error has been fixed, you can leave a feedback below and share the article. How Do I Recover My Bricked Android Phone? Thanks for the different solutions offered. This don’t work on Infinix. The phone is a crap, the phone doesn’t charge except you off it! Great information, especially in the section of “Possible Solutions to ‘App not Installed’ Error”. I like it.